Some of the oldest protective foot coverings ever found can hardly be called shoes at all. The oldest footwear ever recovered was found in an Armenian Cave and dates to around 3,500 BCE. These ancient moccasins were fashioned out of a piece of a rawhide stuffed with straw and tied together with leather strips. Primitive moccasins like this would have been necessary to traverse and hunt in the rocky terrain of the Middle East. However, these moccasins were far from common. The Egyptians were the firsts to incorporate footwear into their society, as ancient Egyptian hieroglyphs almost always depict Pharaoh’s and slaves alike all wearing primitive sandals. 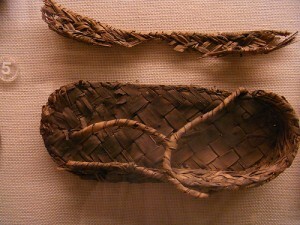 These hard-soled shoes were made by pressing braided papyrus leaves into footprints in the sand, which would then harden and create a reliable sole. Not only were the Egyptians the first to experiment with firm-soled sandals, they were also the first society to footwear as a status symbol, as high society Egyptians would adorn their sandals with precious gems and gold leaf. 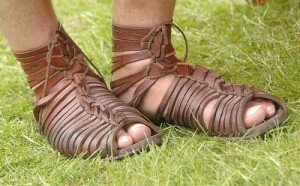 Under the Romans, footwear began to evolve. The Roman sandals, known as caligae, were created using a hard leather sole that was laced with leather strips halfway up the leg and held together with bronze nails. These caligae were thick and dependable, and gave the Roman army a distinct advantage over many of the primitive tribes they encountered during their conquest of Western Europe. In the early stages of the Roman Republic (500BCE) footwear remained very plain, often devoid of any ornamentation or style. However, as the Roman Empire gained power and wealth, caligae became more and more ornate, as the wealthy would adorn them with gold trim and jewels, and Roman soldiers would often plunder gold and silver pins from their enemies to pin into their caligae. Through conquest, the Roman caligae spread throughout much of Europe and beyond, becoming the most common and popular form of footwear for about another 1000 years. A new footwear trend emerged during the Middle Ages, the Poulaine. The Poulaine was fashioned out of either linen or leather and covered the entire foot and lower leg. They were often extremely tight and served much more as a fashion statement and sign of class than they were useful. The most prominent feature was the exaggerated pointed toe. Despite making the shoes much harder to walk in, they became so popular across Europe in the Middle Ages that the Catholic church eventually banned them, and later blamed them for bringing about the Black Plague. By the 17th century, the sabot had become the most popular form of footwear for peasants in Europe. The sabot was carved by hand out of a wooden block and was cheap and durable, though far from comfortable. However, these sabots were difficult to make, and would often be passed down from father to son. It is from this practice that the idea of “following in your father’s footsteps” comes from. However, high society in Europe continued to use footwear similar to the Poulaine, though with less exaggerated points and often-elaborate decoration. Over the next two hundred years, the wooden sabots began to slowly be replaced by leather soled and bound shoes, similar what we think of as dress shoes today. As the standard of living the ease of transportation increased throughout Europe, many English middle and high class citizens began to have leisure time and would often spend it at the beach or playing leisure sports such as tennis. These activities required a different kind of shoe, one that was suited for sport rather than style. The New Liverpool Rubber company seized the opportunity to fill this niche and created what would become known as the Plimsoll. The plimsoll is considered the grandfather of the modern sneaker, as it was the first shoe to use a rubber sole, one that was much more suited for mobility and comfort. This rubber sole was then covered in canvas and was held together by laces, making for a light, comfortable shoe perfect for croquet, tennis and running. The plimsoll successfully filled a niche many at the time did not even know existed, that of the shoe that combined comfort, utility and style into one. It is from these ideals that the first sneakers emerged. Pam Belluck, “Armenian Cave Yields Oldest Known Leather Shoe,” New York Times, June 9, 2008. Web. Andre Dollinger, “Footwear,” Egyptian Garments, 2000. < http://www.reshafim.org.il/ad/egypt/timelines/topics/clothing.htm>. Accessed 4/4/2011. Bronwyn Cosgrave, The Complete History of Costume and Fashion: From Ancient Egypt to the Present Day, (New York, NY: Checkmark Books, 2000), 245-248.